As this giant rock hurtles by our planet, lets take this time to reflect upon living life to its fullest, and to have no regrets if our existence were to come to a sudden fiery end. The image above was acquired today, Nov. 7, by the 70-meter radio telescope at NASA’s Deep Space Network in Goldstone, California, and shows the approaching space rock in unprecedented detail… and this is just the beginning! 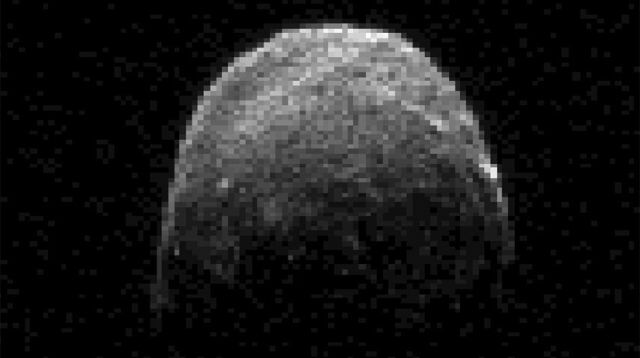 Although it will ultimately come even closer to Earth than the moon, 2005 YU55 poses no threat of impact to either world. At 6:28 p.m. tomorrow, Nov. 8, the quarter-mile-wide YU55 will pass Earth at about 85% of the distance to the moon, coming no closer than 201,000 miles.